In 2018, good journalism will not be enough. This isn’t just my opinion. I’ve seen firsthand how these attitudes and style of reporting are perceived by the public. As part of its News Voices project, Free Press has hosted nearly 20 events over the past two years across New Jersey to ask the public: How’s local journalism doing in your community? What’s working? What isn’t? Are they listening to you? Just the other night at a News Voices event at the College of New Jersey, I listened to a group of five students discuss the need for more in-depth coverage to help them develop empathy and understanding for unfamiliar people and places across the state. What, then, is the job of a journalist who doesn’t care whether or not the audience cares about the news? If journalists want the public to listen, then journalists have to listen to the public. If journalists want the public to care, then journalists have to care about the public. We know that a good story can spark shifts in society in big ways and small. But good stories are not enough to ensure the long-term viability of journalism. So…what will? If journalism is to thrive, it must pair trustworthy facts with trust-building practices. This means moving beyond the often extractive “community engagement” practices and toward “community collaboration.” It means listening to understand without being defensive (like, don’t call widespread and agreed-upon criticism “the most ridiculous overreaction”). If journalism is to thrive, it must fix its foolish lack of diversity in newsroom staff, sources, and stories. It must also uphold democracy by being more democratic in its newsgathering process, and take bold action in defense of the First Amendment by partnering with media justice activists. Perhaps most importantly, if journalism is to thrive well into the future, it must acknowledge and fight against its contributions to maintaining the status quo, both on the front page and inside the newsroom. Journalists should use their privilege to be in solidarity with people whose stories are rarely told, who are leading struggles for meaningful community change. Good journalism challenges power, rather than cozying up to it. What is exciting, and what fills me with hope, is that we’re seeing forward-thinking organizations and their leaders redefine what it means to do good journalism. The Listening Post Collective, Education NC’s Reach NC Voices, and Outlier Media are all meeting people where they are, taking time to listen and ask questions about what information they need, and building creative ways to provide it to them, whether it be through text messaging, shared meals, or in one case, a community baby shower. I am also deeply encouraged by the Gather platform, where already more than a thousand journalists, dedicated to a vision of people-powered journalism, share their ideas, make new connections, learn new skills, and support one another. The stronger this network gets, the bigger it grows, the more we all move in the direction of real and meaningful trust between newsrooms and the public. It is time to discard the perception of “good journalism” as being enough. Whether newsrooms want to acknowledge it or not, there’s a substantial disconnect between them and the public on the role of journalism in our communities and for our democracy. Ignoring that disconnect will not make it go away. Instead, let 2018 be the year that journalism starts by listening and believing that people do actually, deeply care about quality news and information. May this be the year journalism lifts up the voices of people of color, women, and those on the margins, embraces trust-building practices, takes a stand for press freedom, and teaches us how power works. Mike Rispoli, News Voices director at Free Press, contributed to this piece. 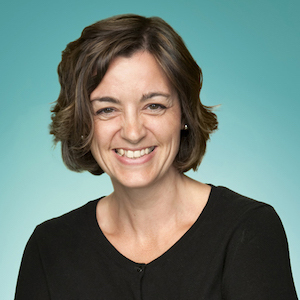 Molly de Aguiar is the managing director for the News Integrity Initiative at the CUNY Graduate School of Journalism. Dec. 14, 2017, 10:48 a.m.